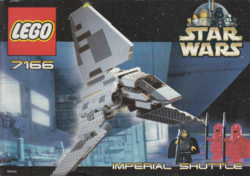 7166 Imperial Shuttle is a Star Wars: Episode VI Return of the Jedi set released in 2001. This is a description taken from LEGO.com. Please do not modify it. The Emperor is coming! Only the bravest Imperial officers dare face the Emperor! And here he comes, ready for all your Star Wars adventures in his own Imperial shuttle. The back opens for boarding, and the wings extend for flight! Comes with the Emperor, two Royal Guards, and an Imperial pilot! Facts about "7166 Imperial Shuttle"
ShopDescription The Emperor is coming! This page was last edited on 25 November 2017, at 16:26.